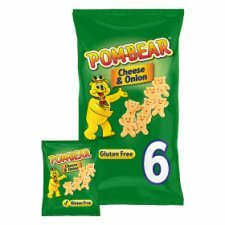 Pom-Bear has created these deliciously light & crispy potato snacks that simply melt in your mouth. These bear shaped snacks are great fun to eat and the cheese & onion flavour makes them really yummy too! These Pom-Bear snacks are cooked with sunflower oil. They are gluten free and contain no artificial colours or flavours. Store in a cool, dry place away from bright light.